You can stow all the equipment you need for a day's climbing in the Rock On 30 Rucksack from Jack Wolfskin. This minimalist alpine pack was specifically designed for climbing and via ferratas. 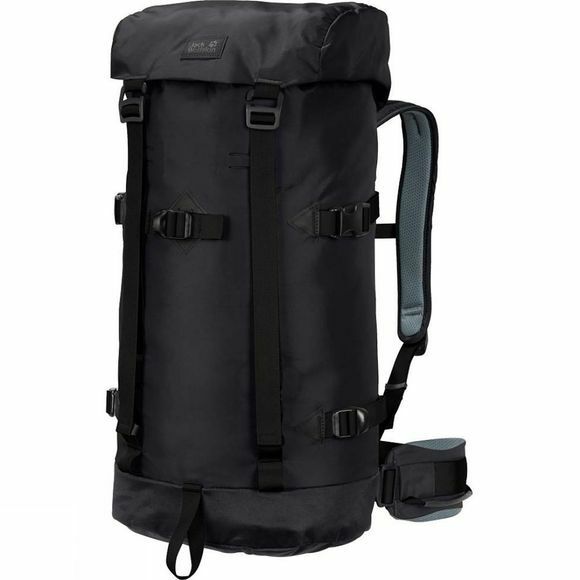 The pack is very light and well organised, with packing and lashing options for all your personal gear and safety equipment. Carabiners and quickdraws can be clipped to the gear loops on the waist belt or stashed inside the main compartment, along with your fleece or belay jacket, water bottle and snacks. Important little items like your wallet, mobile phone or climbing guide can be kept safe in the waterproof lid compartment. And if you don't need it the lid compartment can be removed, making it even lighter. The waist belt and back plate are also removable.